CHRISTMAS MUSIC & COMEDY by Vegas Man. A one hour musical extravaganza of the very finest holiday music & comedy. . "Let It Snow", "Winter Wonderland", "White Christmas", "Here Comes Santa Claus" & many more popular Christmas music. This show is G-rated. Perfect for office parties, nightclubs, libraries, retail outlets, family parties, senior & health care facilities, performing art centers, fashion shows, municipal holiday celebrations….You name it… Merry Christmas & Vegas Baby! Tom was the best. Brought some good energy to help a manager recover from a medical issue. Tom is very personable and a great showman. Tom did a great job keeping our geriatric residents continually entertained, happy and excited with his variety of songs and his charming personality. He delivered exactly what we asked for. He sang hits from the 50's and 60's and gave a special appearance by "Elvis". We would definitely have him back! Really enjoyed the show. Great vocals, guitar and personality! 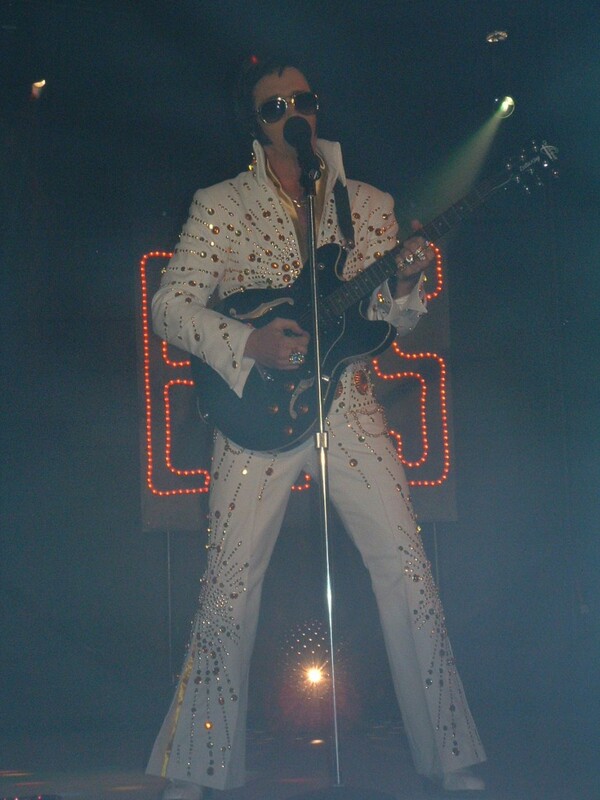 I love Elvis and it's obvious that this entertainer does too. I really shows in his act. Is he Elvis...no. But that doesn't matter because his presentation is fun, playful and pays due respect to the KING! Check it out for yourself. We have had Mr. Vegas' Man twice. 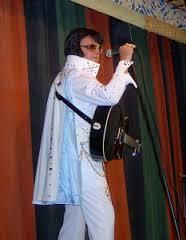 Once was a general show for our Christmas Party, and the other was an Elvis show during National Nursing Home Week. he was great with our residents and they really enjoyed both shows. Insurance: $1,000,000 - Fully Insured! Professional entertainment that is enlivening & fun! 1st rate singing & performance. All strictly G-rated. Very interactive- includes sing-a-longs as well as standard performance style fare. Lots of great music, fun & surprises- all G-rated- suitable for for the entire family. Vocals & guitar by Vegas Man- strolling or stationary - with optional bass, drums, piano & sax- dressed in festrive holiday attire. The show has been presented at private & corporate parties, senior facilities, schools, retail outlets, fashion shows & malls. Don't miss it. Book now! Vegas Man ( Aka Tom Fivenson) is a native of beautiful & snowy Traverse City, Michigan. 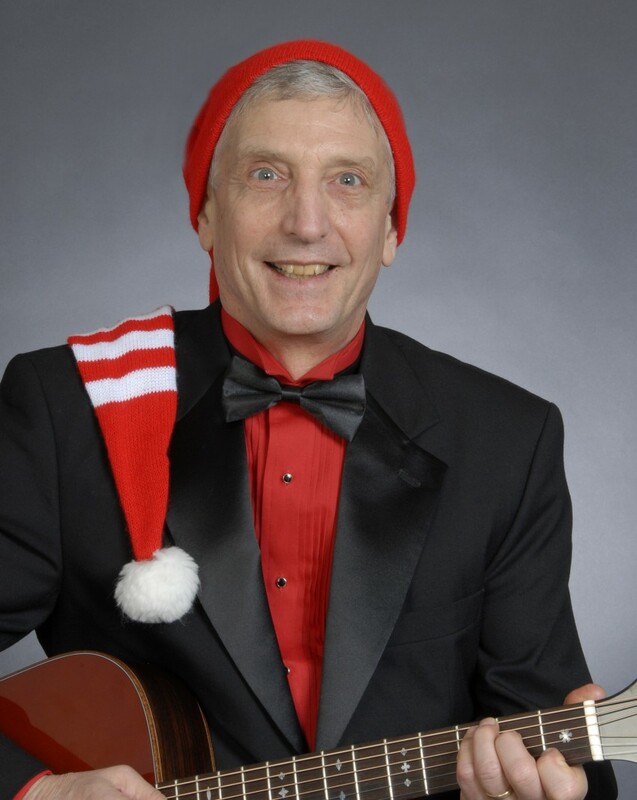 A graduate of the University of Michigan, and now living in Ann Arbor, he has been performing the Christmas Extravaganza for over twenty years. Show includes includes seasonal favorites like “Here Comes Santa Claus”, “Let It Snow” & “Winter Wonderland” along with more esoteric gems like “Christmas Island”, “Blue Christmas” & “That Old Christmas Moon”. State of the art sound. Amplification with special audio effects- including professional quality backing tracks. Sinatra, Elvis, Dean Martin, Milton Berle, etc. Chilled drinking water is greatly apopreciated. Close to electricity. Grounded plug is preferred. Prefer aisled seating so performer can move freely among, & interact with, audience members. A minimum 4' X 4' performance area. Amazing performance! Mr. Vegas Man is a rare & unique talent! "I wouldn't have predicted the beautifully warm and understated arrangements I would find on his fine recording. These are the essence of old-fashioned traditional Christmas songs. I've listened to the whole thing through several times now, and just can't get enough of it." It was a wonderful show. Everyone hopes you can return sometime soon! Thank you so much! Thank you for your wonderful performance!